'Words and Phrases In French'. Prepared under the authority of the Director of Military Intelligence. The War Office, April 1944. P/b, 10.7 x 13.5cm. 19p. 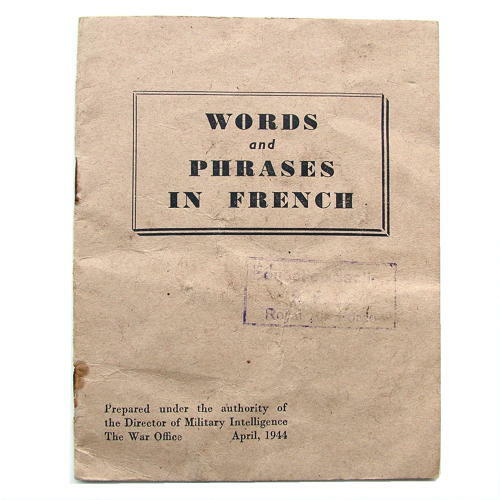 Contains useful words and phrases to help soldiers and downed airmen in French speaking territory. Has sections on 'finding your way', 'warnings', 'if lost or escaping', 'if wounded' etc. Essential reading for any serviceman heading to / flying over France during WW2. The cover is creased and soiled. Inner pages a little creased. Staples corroding. Cover overstamped ' Education Section B.P.C Royal Air Force'. Stock code P20636.